The view towards Ann Street. An office building, now (February 2019) vacant following the occupant’s move to other premises. 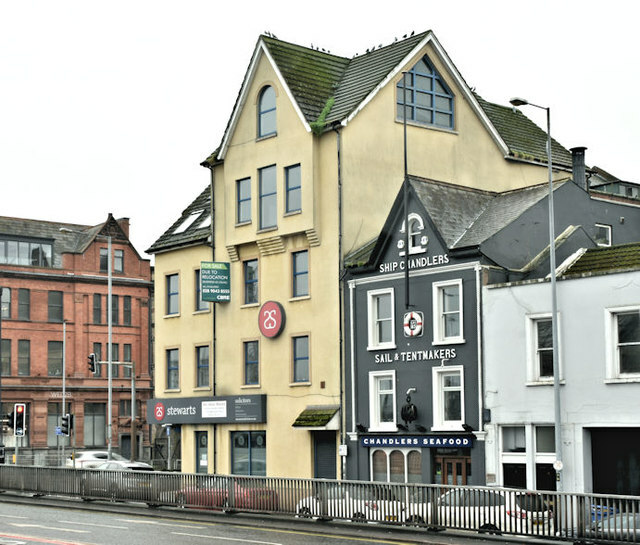 Advertised for sale, the agents’ description includes “The property is zoned as a City Centre Gateway site under the Belfast Metropolitan Area Plan. A planning report has indicated that the property may be suitable for redevelopment with the erection of a new building 6-8 storeys high. The planning report can be made available upon request” - agents’ brochure. Previously occupied by the “Quayside Inn”, there had been a public house on the site since, at least, 1877 (“5. Mullan, Patrick, spirit dealer 3. Byrne, Caroline, spirit dealer” - before renumbering). I have no connection with the premises or the sale and cannot enter into correspondence.